Polar coordinates provide us with an alternative way of plotting points and drawing graphs. You can express complicated graphs using simple polar functions. One of the applications of polar graphs is to describe the characteristics of microphones. Polar graphs are quite different to those we produce using our familiar Cartesian coordinate system (the familiar x-y axes). In the polar coordinate axis system, the point (r, θ) is defined as follows. Along the (horizontal) polar axis, go out r units, then rotate in a positive direction (anti-clockwise) about the pole by an amount θ. This is shown in the following diagram. Example: The point (7, 120°) in polar coordinates is plotted below. We go 7 units out the polar axis, then rotate around the pole by 120°. Example: Let's draw the curve r = sin θ using polar coordinates. Let's now choose angle θ = 30°. For this point, we need to move out r = sin 30° = 0.5 from the origin, then rotate 30°. For a 3rd point on our graph, we choose θ = 45°. For this point, we need to move out r = sin 45° = 0.7071 from the origin, then rotate 45°. Choosing another point θ = 80°, we need to move out r = sin 80° = 0.9848 from the origin and rotate 80°. The following cardioid is the graph of the function r = 1 − sin θ. This time the start point for the graph is at (1, 0°) (which is at 1 on the horizontal polar axis) and the curve is generated from there in an anti-clockwise direction. It is called a cardioid because it is heart-shaped. This is the graph of r = sin 4θ. The result looks like the petals of a flower. You can find more information and examples about polar coordinates in this introduction to Polar Coordinates. You can also print your own polar graph paper (in PDF form). Different microphones have different recording patterns depending on their purpose. a. Omni-directional Microphone: This microphone is used when we want to record sound from all directions (for example, for a choir). The recording pattern is almost circular and would correspond to the polar curve r = sin θ that we met above. The following diagram shows a real recording pattern for an omni-directional microphone, graphed on polar graph paper. 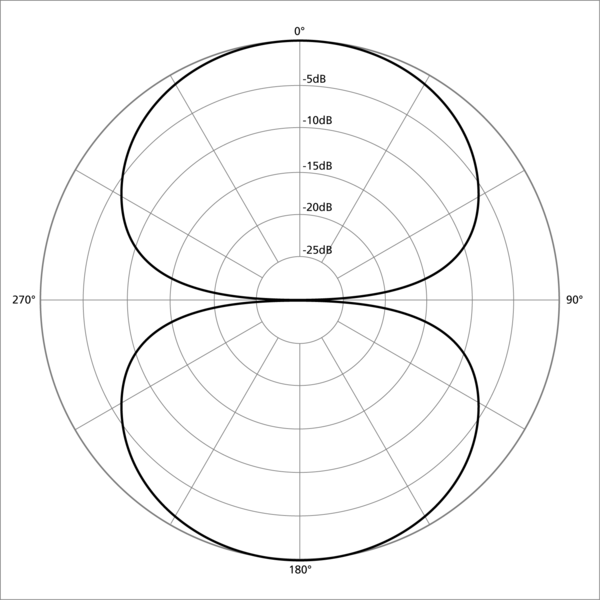 The different curves are for different frequencies, and the placement of the microphone is at the center of the circle. At low frequencies the pattern is almost circular, but at higher frequencies it becomes less so and more erratic. c. Shotgun Microphone: This is a "super-directional" mike, where we only want to pick up sounds from directly in front of the mike. The graph used for this example is r = θ2. d. Bi-directional Microphone: This is used in an interview situation, where we want to pick up the voices of the interviewer and the person being interviewd. So next time you see a microphone (in your mobile phone, notebook computer, in a recording studio or wherever), remember that the shape of its recording pattern is an interesting application of graphs using polar coordinates! See the 22 Comments below. my loop performance is very intermitent. As none of the volunteer sound engineers are deaf they have very little understanding of the problem. concerning microphones, yes, the polar co-ordinates hold true. I am thinking if it is applicable to antennas, speakers and receivers. James: Perhaps it is the type of microphone they are using. If it is too directional, it means the signal will be poor unless the speaker is standing right in front of it. But what you describe sounds a bit more like interference is occurring, rather than poor microphones. Any experts out there with some insights? So cool! Never thought about how mics work before !!! we studied polar graphs in unversity .. but I was shocked when I found the relation between them and microphons..
thanks to you M. bourne. Thank you about this knowldge. i haven't been imagining maths to be a real life application. you are giving the best! When it comes to your problem, James, polar coordination will not help understand what is going on. Most likely there is a electromagnetic switch on the polarity of the microphones and/or the latter of the stereo speakers. Because of this there is a cancellation of signal which human ears are often not affected by unless it is times very perfectly. However, microphones in a hearing aid may not be so fortunate and, relying on a different compilation of vibration and/or air pressure formed waves, they may experience the cancellation. Just a theory- info am not a professional by degree but I do hold expirience in the field via studio, concert, and theoretic/mathematics work. I also apologize for any spelling and grammar errors as I typed this on my phone. This is what I am learning now in my course. The explainations and procedures here are simple for me to understand and follow at my own pace.... I like it!!!!! Hi Cruzplato - glad you find IntMath.com helpful! Motivated by your discussion about the echidna durve, I've made a video about my take on a variant of that curve and equation. An omnidirectional microphone would correspond to a polar function of r = 1. Your circular equation, r = sin(θ), for an omni mic would neglect sound from negative y positions, and, therefore, not be an omni mic. This is otherwise a great explanation of real world polar function examples. Thanks for sharing! @Noble - it depends on the placement of the microphone in the resulting circle. As shown by the image in that section, the microphone is placed at (0, 0.5) (using Cartesian coordinates). Yes, we could also think of it as r = 1, adn place the microphone at (0, 0). Same result.